Think out of the box. Brainstorming needs more than a boardroom and coffee. Get inspired for that trailblazing product or strategy or build camaraderie with colleagues at these mind-refreshing villa getaways. Projectors, fax machines, WiFi, air conditioned rooms suitable for meetings and a good coffee machine are just some of the facilities you would expect to find to oil the wheels of industry. We loved Indisch’s setting on a sweeping curve of coastline; the ocean panorama made all the more interesting by the waves crashing onto rocks just offshore. Indisch is incredibly spacious, and with plenty of places to enjoy privacy it’s ideal for a couple of families, friends travelling together or even for big family reunions. There’s a wide veranda to the front (with sun screens that are very effective at reducing glare without blocking the garden and sea from view) where we dined most of the time or sat quietly and read. We liked that there’s a music system built into the living areas (although it doesn’t connect with an iPod), and the TV in the study is a good distraction for kids – and us, on a rainy day. Run with the efficiency of a hotel, Indisch has a big attentive staff team and an excellent chef who dazzled us with his repertoire of dishes – Sri Lankan and international. The kitchen is principally the domain of the staff but parents needing to prepare children’s or babies’ meals are welcome to use it on request. Indisch is 30 minutes’ from Galle’s dining scene, but the villa food is so good that this doesn’t matter. This slightly away-from-it-all location might be just what many people are looking for. The villa has a vintage Mercedes which can be used to take guests on nostalgic rides through the neighbourhood (recommended), and there is also a van at the villa which can be made available to guests (charges apply). We’ve stayed in lots of villas over the years, and it’s fair to say that Indisch is one of the most immaculately presented and staffed in Sri Lanka. On our recent visit, we were impressed by how well the villa has been maintained - it still looks new, and the dedicated staff team seemed to be constantly cleaning. We visited as a big group and the excellent chef managed to pull off a spectacular dinner every night – we requested Sri Lankan food most of the time, and he managed to make every meal different. The villa’s garden has matured beautifully and forms a natural screen from the beach, ensuring privacy. 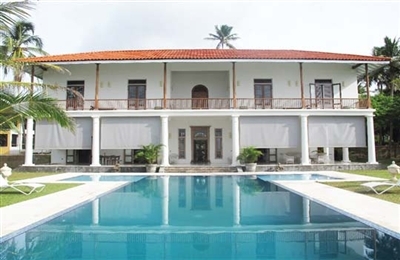 Lassana Kanda is a destination in itself – one of Sri Lanka’s grandest private villas (on a par with those in Bali and Thailand) and offers such an abundance of space and facilities that it encourages you to stay put. The interiors were furnished elegantly and felt distinctly uncluttered. The pool is stunning and plenty large enough to swim decent lengths while others relax in the shallows and admire the gorgeous palm-fringed valley views. The meticulously designed tropical gardens complemented the verdant hillside setting perfectly. We loved the pool pavilion for dining and the sun deck for relaxing on the plentiful loungers. The guesthouse has a little kitchenette and works well for independent teens as well as elderly relatives or less mobile family members who prefer ground level bedrooms. There are plenty of kids’ toys and facilities at the villa and this, together with such an abundance of space for letting off steam or finding your own quiet corner, make Lassana Kanda a dream destination for families. The villa has a dedicated staff team. The manager is also an experienced chef (he’s worked in Australia and the UK) and served us seared tuna with a mango salsa for lunch and a Thai selection from one of his evening set menus; both meals were excellent. Staff do not live in, but there is 24-hour security and the manager is on call.